Cost is a sensitive priority in paper industry. It is particularly crucial for enterprises in paper industry to make accurate cost calculations due to high competitive environment arising especially from globalization. Productivity and optimization should be achieved in processes such as calculation of recycled papers, determining paper costs for new and different requirements and detailed stock tracking. 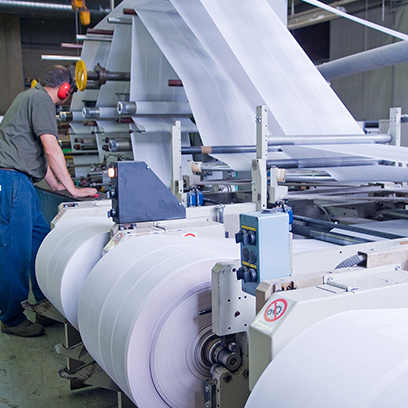 Obtaining a sustainable efficiency in paper industry depends on more efficient operations, more affordable costs, an effective production method, projecting customer and market expectations accurately and on time and effective systems that will meet special needs. With Login Corporate Business Solutions, we help our customers in paper industry to make production to the needs of their customers. You enable them to create product trees fast and efficiently in quoting or order placement phase and support them to push up productivity and profitability with fast and easy costing. We have been offering Login Corporate Business Solutions that are customized to the needs of our customers in paper industry since 1989 and updating them continuously in line with industrial developments, changing needs and legislative amendments and customizing them to meet specific needs of our customers. Our solutions that enable our customers operating in the paper industry to make a difference and stand out in the competition. Do you order-to-make in your enterprise? Do your products constantly change according to requirements and innovations? Should the most elaborative data be taken into account in your cost calculation processes? With Login Corporate Business Solutions, you can create fast product trees, transfer product trees that you have created into production planning and make material requirements planning for production and plan capacity of machinery for operations. You can make shipment in the optimum conditions after production, complete invoice and dispatch note processes and offer after-sales services. You can foresee problems by keeping records of all products and services and develop solutions fort hem. You can stand out in the competition in your industry with effective stock control and detailed cost analyses.